As much as I keep hoping my combination skin will normalize itself as I get older, it doesn't seem to be happening - which means that along with my shiny face, I get all the signs of aging too without a product meant to deal with both issues. Matifying products seem to be aimed at women in their twenties who aren't yet concerned with aging and anti-aging products seem to be intended for dry skin or at least for people who like their products heavy! 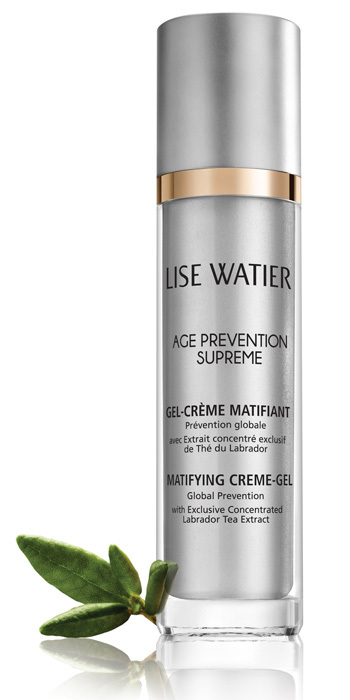 Lise Watier Age Prevention Supreme Matifying Creme-Gel - 50ml - $69 - specially formulated for combination to oily skin to control excess sebum, tighten pores and provide a mattifying effect - while at the same time fighting the first signs of aging by reducing the appearance of fine lines, evening out skin tone, refining skin's texture and renewing skin's radiance. It does all this with concentrated Labrador tea extract combined with dandelion extract along with a sebo-regulating complex and matifying powders. What's really nice about it is how light the texture is so it's perfect for layering - you can easily put it between your serum and sunscreen without feeling like you're wearing tons of product! Available now at drugstores across Canada and online at www.lisewatier.com.